The beginnings of an organization is a story worth considering. Each has it’s own history. No two are alike. This is the story of the early history of Centennial Counseling Center’s (CCC’s). I founded and superintended it’s growth to what it is today. My hope is that by sharing this ancient history we might increase our understanding of how CCC became what it is. More importantly I hope it is a useful case example. Here is something to ponder. I personally have provided about 35,000 hours of therapy over my whole career. In 2018, CCC will be close to providing that same 35,000 hours of therapy in a single year. While CCC may have developed out of my individual clinical practice, what it can do far exceeds everything I could do in a career as a solo practitioner. In those first ten years I did not have a fully formed idea of what a private practice was or could be. And as that vision morphed and responded to the changing mental health climate, it eventually grew into the vision of the CCC that we know today. I was not too far into my early years of practice before I discovered how lonely it is to do therapy by oneself. My clients were great but they did not fill all my needs. I began to think about something larger than a solo practice. My first vision was to collect a handful of people who would join me, sharing the space I was renting and help with two objectives—meeting needs in the community in a way that was similar to my style and then giving me workmates who could help with my loneliness. Eventually CCC got going well enough that it only took two to three years for someone to join CCC and develop a caseload of 20 to 25 clients per week. At the time that pace was a huge success for us. Now with our current methods, we view that as a very slow pace. We slowly grew in the number of sessions we provided the community and in the number of staff working at CCC. Following is a table of some numbers from CCC’s 12th though 26th year. We hovered around 8 clinicians per year from 1994 to 1998 (in red). 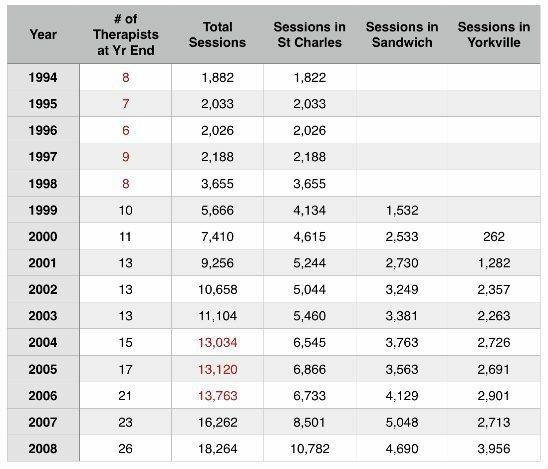 In these years, we did not add many new therapists even though each therapist we had was getting busier and overall sessions were going up a little. In March, 1999 we added the Sandwich office and a year later, the Yorkville office. Adding these offices grew both our staff numbers and our sessions. From 2006 and beyond, we have continued to add staff and sessions each year increasing the impact we have in each of our communities. One of my first impressions as I have been writing this has been about how long it took to develop the various elements that now almost seem routine. As of this writing, CCC has just completed it’s 35th year. CCC has come a long way and has grown into a resilient, vital, and impactful organization and community of clinicians. And I am grateful for each person’s contribution to making it what it has become.